A good confectionery artisan knows that the best Star Wars cakes are a lot like Hasbro’s new, deluxe Millennium Falcon . They’re faithfully detailed on the outside, feature gratifying surprises on the inside, and are over two-and-a-half feet long from bow to stern! But, you know… two out of three ain’t bad. So we’ll give this diminutive Yoda cake a pass. Anne Heap and her husband Jesse of New Jersey’s Pink Cake Box crafted this cake for the 30th birthday of a Star Wars enthusiast friend of theirs. Anyway. Anne and Jesse made a Yoda Star Wars cake for a grateful American friend of theirs. 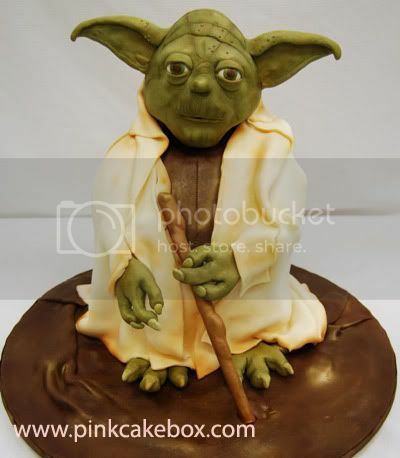 And they didn’t employ any conventional cake flavors for this particular treat, like “white” or “not white.” Upon slicing a chunk out of Yoda, their friend discovered green pistachio cake with chai buttercream. Hell yeah. I mean, I don’t know the actual color of Master Yoda’s innards, but green seems just about right. Plus, I happen to know that midi-chlorians taste a lot like chai buttercream, so… bonus points. Thanks to Anne and Jesse for sharing the picture and details. Check out the Pink Cake Box blog for more of Anne’s work. Or you can put down your video games long enough to see the cake she made for Rachel Ray’s 40th “surprise” birthday on today’s episode of the Rachel Ray Show.